Fall is a cold time in the garden. Frost is always a possibility. That is when plastic protection comes in handy. In a real greenhouse with heat and insulated sides, tropical plants do well. I don’t have a greenhouse. So I grow cold tolerant plants in the fall: cabbage, turnips, rutabaga, spinach, broccoli. These can take night temperatures down in the twenties. The other night was forecast to be in the teens. Panic time. Normally I clear my summer crops out in October. This year I picked up walnuts. Each fall I spread plastic over my shade house and remove it in the spring. I get plastic wide enough to cover the entire house at one time. The ends are done with the plastic taped to the panels. The main sheet is put over these. The ends are weighted down with old fence posts. Four or five lengths of baling twine are passed over the top to keep the plastic from billowing up in the wind. It must be monitored on sunny days as the inside heats quickly. Clearing out pepper plants isn’t too much of a problem. Tomatoes are another story. The vines this year went up over the shade house. And over is the word for it. In truth, this worked fairly well as long as I held the vines in place with twine so the wind couldn’t blow them off. I could go inside the shade house and pick tomatoes at head height and below. The downside was one of the varieties I grew. It was a large dark striped cherry sample packet included free with my order. These split whenever I watered, it rained, they got ready to turn color. Then they came down with blight. They were intertwined with others on the shade house so I had to tolerate them for the summer. 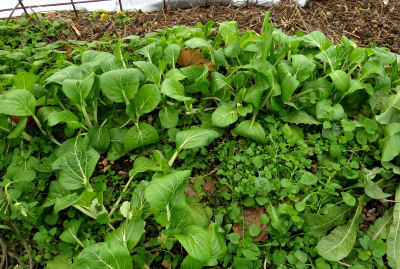 Pak Choi and chickweed are doing well inside the shade house. On really cold nights I spread split feed sacks over the plants for more protection. Now the vines were dead from killing frost. 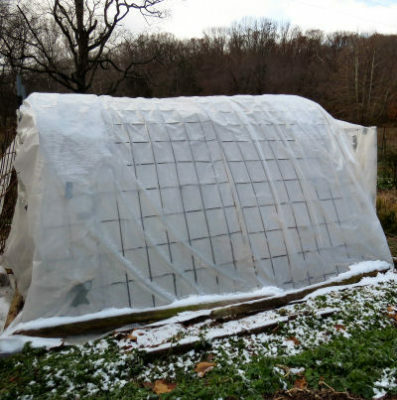 The cold crops inside needed plastic protection for the winter. It took several hours to clear the vines. There seems to be an unwritten rule about putting up plastic sheets. As soon as the sheet is maneuvered into place, the wind blows. Once the sheet is on the ground or draped over your head, the wind stops. 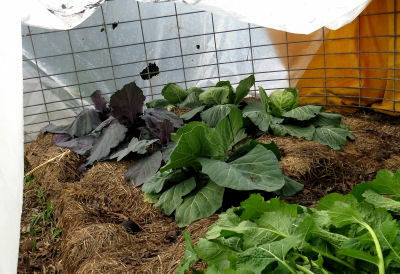 This year the turnips, broccoli and cabbage are not in the shade house. Makeshift wire structures were thrown up around them to hold their plastic protection over them. There wasn’t quite enough plastic for over the cabbage. The make shift place has the open areas covered with blankets except during storms. The cabbage isn’t happy right now as I got home late and the blankets were late in getting put up. Plastic itself won’t hold plants when the temperatures are in the teens. That’s when old blankets and feed sacks come out. Draping these over the plastic structures or over the plants in the shade house now unheated greenhouse will. The thermometer read fifteen in the morning. My fall garden made it through. A side benefit of the plastic protection is heat. Sunlight goes inside and warms the soil and plants up to summer conditions. Venting keeps things under control. And a few more fresh veggies will be available until mid winter. This entry was posted in High Reaches and tagged gardening, planting for fall, solar greenhouse on November 14, 2018 by [email protected].